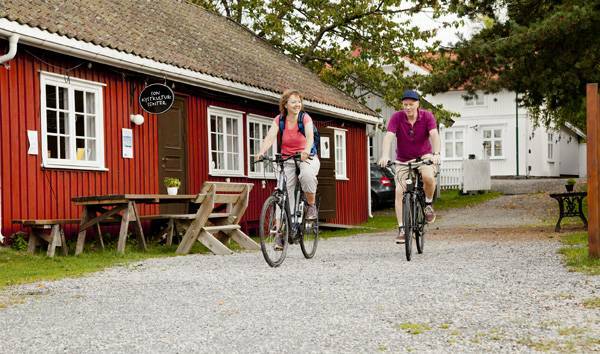 During this self-guided bicycle tour with luggage transfer, discover the hidden charm of the harbour villages along the fjord, while bicycling on small, low traffic roads and bike paths. Itinerant circuit with overnight stays in centrally located hotels. And yes, you should bring your swimming gear. 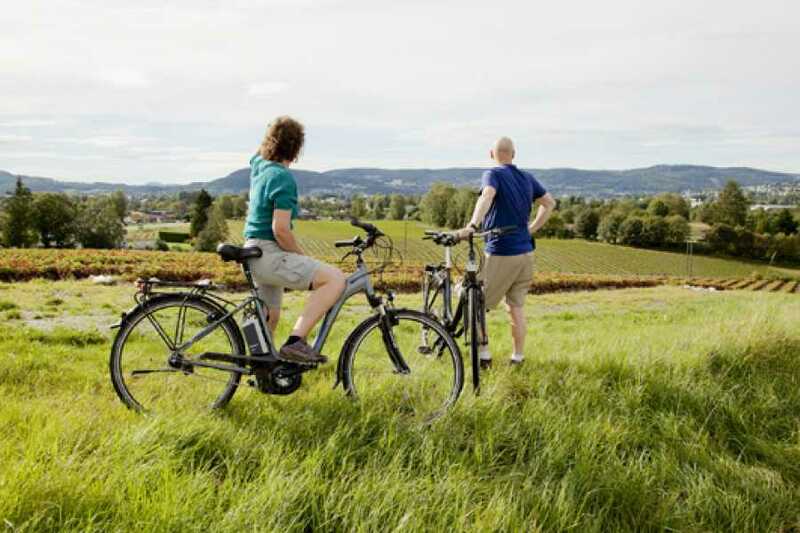 The Self-Guided trip includes 6 nights with breakfast in centrally located hotels (3/4*), luggage transportation, bicycle (possibility for electric bikes), route descriptions and maps, GPX files, boat Sandefjord - Strömstad - Fredrikstad, bus or boat Drøbak - Oslo, and a hotline service. Route profile: This tour has been rated category 2 because of some uphills and a relatively curvy landscape on some stretches. The daily legs are between 17 and 55 km. 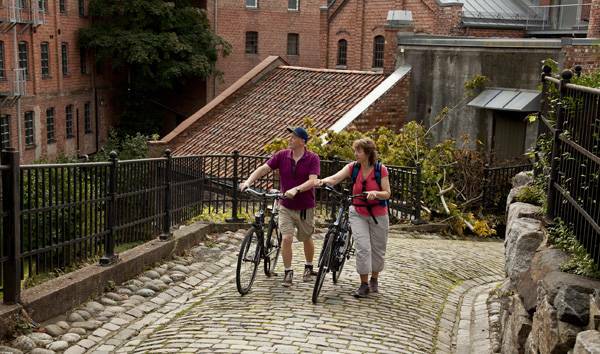 We advice you not to choose this tour unless you are used to cycling. 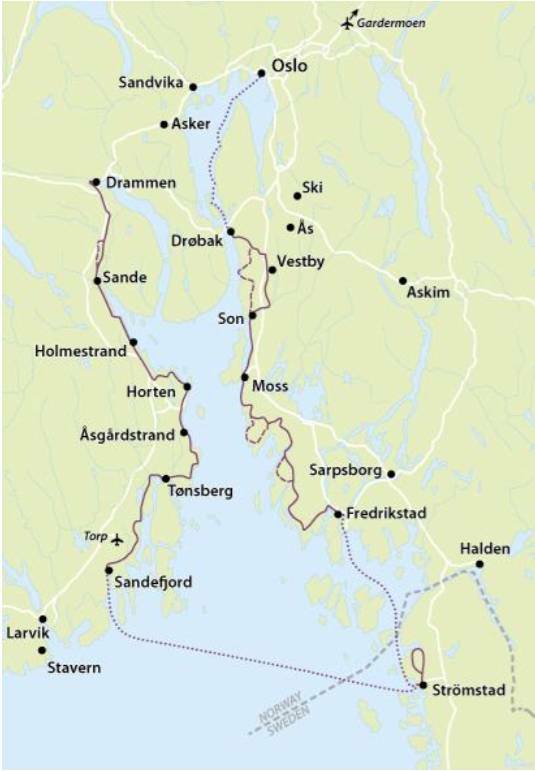 Three 3 - Star hotels and three 4 - star hotels (Sandefjord, Son and Oslo - some with SPA possibilites) . The rooms all have en suite bathrooms and air conditioning. In the unlikely event of changes you will receive un updated hotel list when arriving at your first hotel. A rich breakfast buffet is included every morning. Extra nights in Drammen: Single NOK 840 - / Double 540 (breakfast included).Prices per person per night. Gel saddle for the seat. If you wish to bring your own, remember to pick the biggest size available. GPX files on request before departure. You must bring your own device. If you are not firmly decided to book yet, please call us or send us an email instead of using the online booking system. Once we receive a booking request we have to contact the hotels to check their availability on the requested dates. Do not book your flight until you've received an email confirmation from us. This may take from a couple of hours to 3- 4 labour days. The heart of Drammen is around Bragernes square and the riverbanks for nice strolls on both sides of the river, it even includes a nice beach for swimming and relaxation in the middle of the town. Your hotel is located in a former industrial area by the river which now has become a trendy place to live. We can also recommend a walk in the nearby area of Nybyen with small, white wooden houses and the Drammen Museum with its nice park (www.drammen.no). Today´s stage starts along the river Drammenselva towards Vestfold county. Slightly uphill route across fields where you can enjoy the rural landscape. Just before the town of Holmestrand you will catch up with the fjord again. (www.visitvestfold.no). 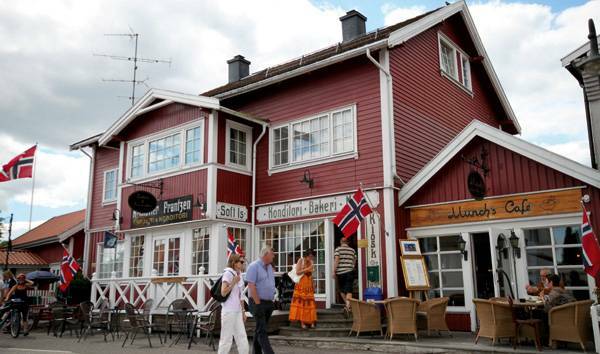 In Holmestrand you can stop for a nice lunch with a view over the fjord and the harbour. In the afternoon the tour continues along country roads to the town of Horten, which used to be Norway’s most important naval base. The fortified naval museum, called Karljohansvern, is worth a visit. Your hotel is close to the harbour. 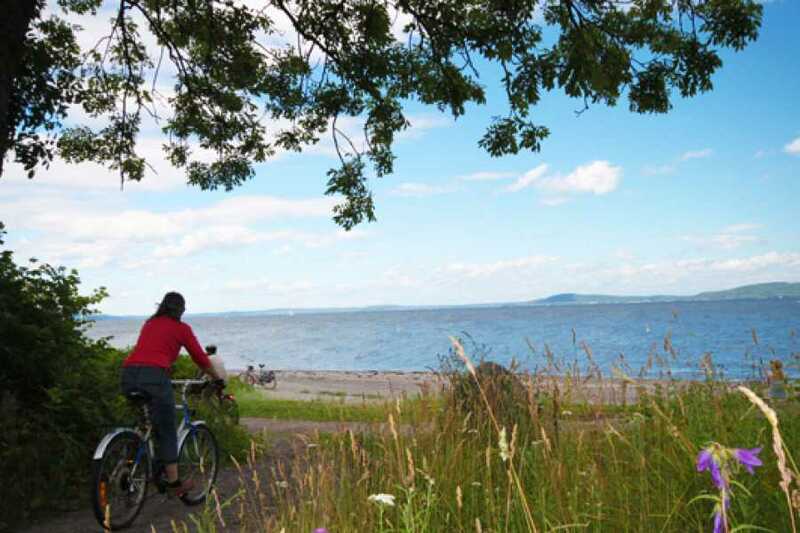 The bicycle lane from Horten will take you along the coast to the village of Åsgårdstrand. On your way to Åsgårdstrand, at the Midgard Historical Center, you can experience how the Vikings lived. (www.midgardsenteret.no). The famous Norwegian painter Edvard Munch spent many summers in Åsgårdstrand where his small wooden house has been turned into a museum (www.munchshus.no). 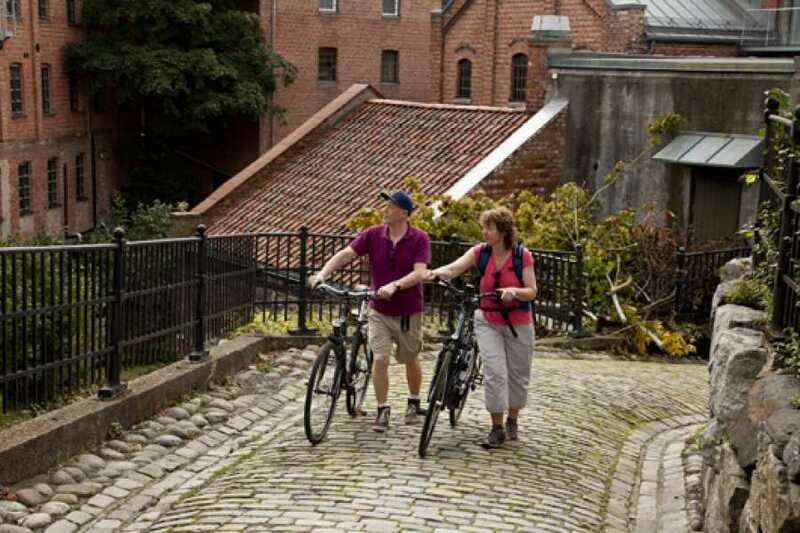 In the afternoon, the tour continues along the coastline to Tønsberg, the oldest town in Norway. You will pass the beach Skallevollstranda, where you may go for a swim in the fjord. We recommend to visit the local art museum Haugar Vestfold Kunstmuseum and the lively harbour of Tønsberg to see how local craftsmen are building copies of Viking ships. The road from Tønsberg to Sandefjord passes by the municipality of Stokke, the lovely little hamlet Melsomvik and the burial mound where the Viking ship Gokstadskipet was found (Gokstadskipet is on display at the Viking Museum in Oslo). 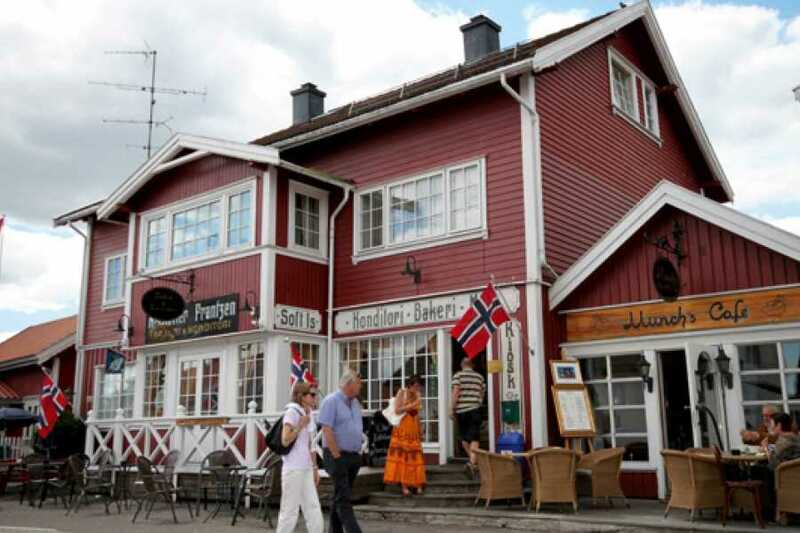 In Sandefjord, you can visit the Whaling Museum (Hvalfangstmuseet) and enjoy the evening in the nice harbor area. You will start with an early morning departure on a car ferry from Sandefjord to Strömstad in Sweden, on the east side of the Oslo Fjord (about 2 h 30 min). Once arrived in Sweden, you will cycle a 15 km loop along small roads and through some villages north of Strömstad (www.vastsverige.com/stromstad). We recommend you to bring your swimwear and a towel if you want to enjoy a refreshing swim in the fjord. 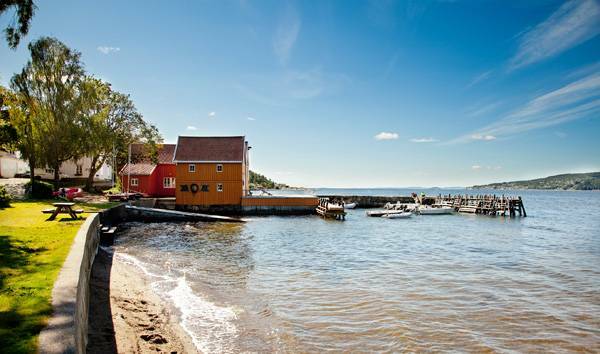 The town of Strömstad is well known for shrimp fishing and has a nice downtown area with restaurants and shops. 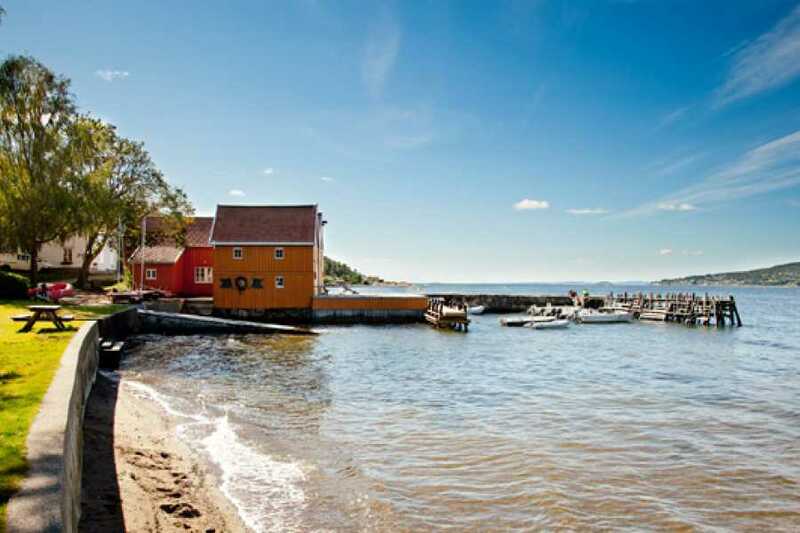 In the afternoon, you will board the passenger ferry “Sagasund” to the Norwegian city of Fredrikstad, navigating across the fjord and its beautiful archipelago (about 2 h). The old part of the city (Gamlebyen) is the best preserved fortified town in the Nordic countries (www.visitoslofjord.no). 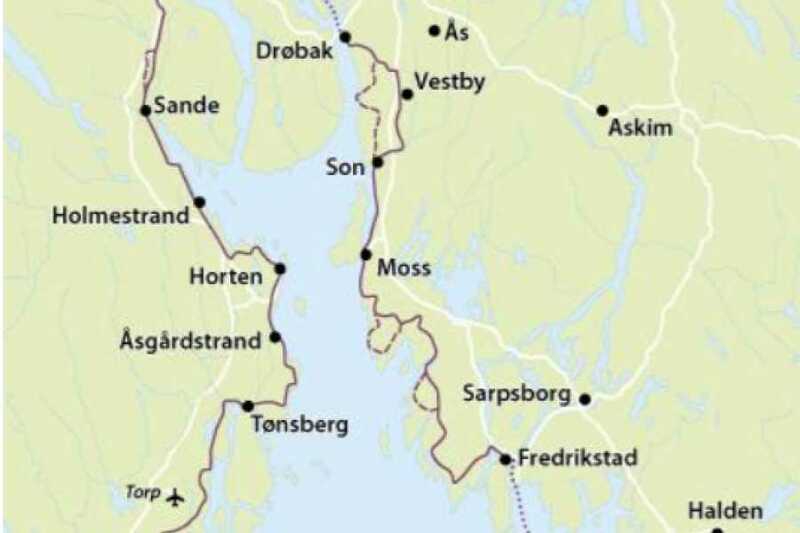 Today´s bike route starts along the fjord, just outside Fredrikstad. The route crosses many small villages and allows you to make a small detour to charming Saltnes. 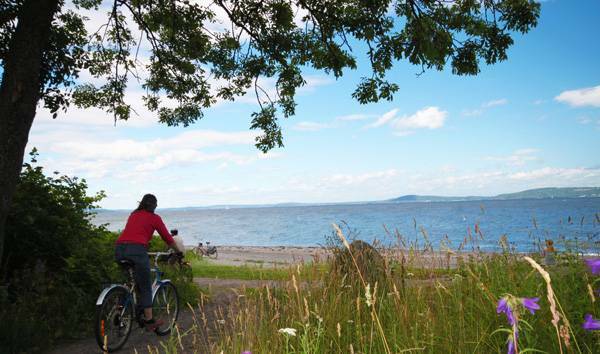 You can cycle the inland road or choose a 5 km longer ride along the fjord, via Larkollen. 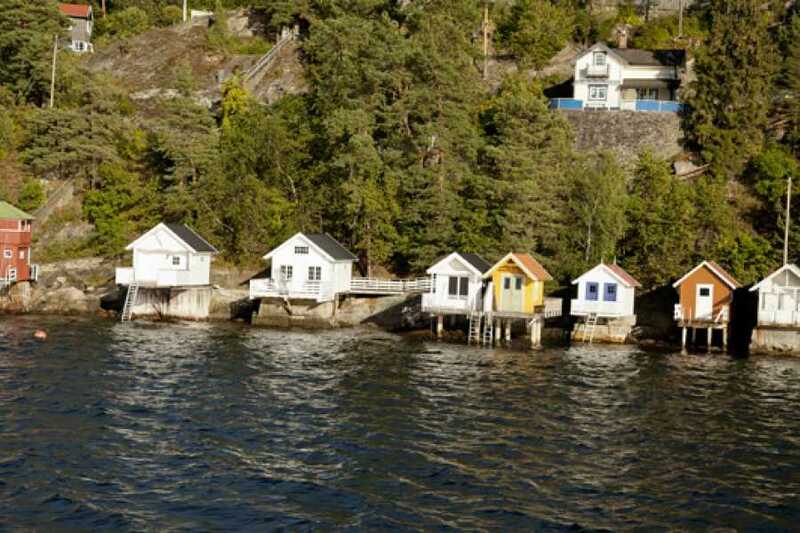 In the afternoon you will reach the town of Moss with its typical wooden houses. The areas once occupied by wood and paper industries, are now filled with cafés and art galleries. Your hotel for the night is either in Moss (Cat. B) or in Son (Cat. A), a nice little harbor village 10 km further. This is the last cycling day. From Son you can choose between two different countryside roads. The first one passes the nice village of Hølen and continues along a bicycle lane to Vestby. 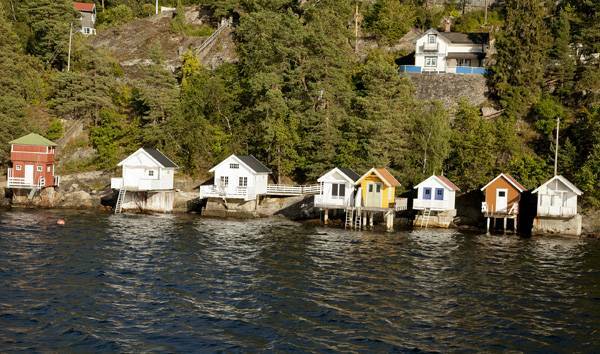 The second one leads you to the beautiful village of Hvitsten. 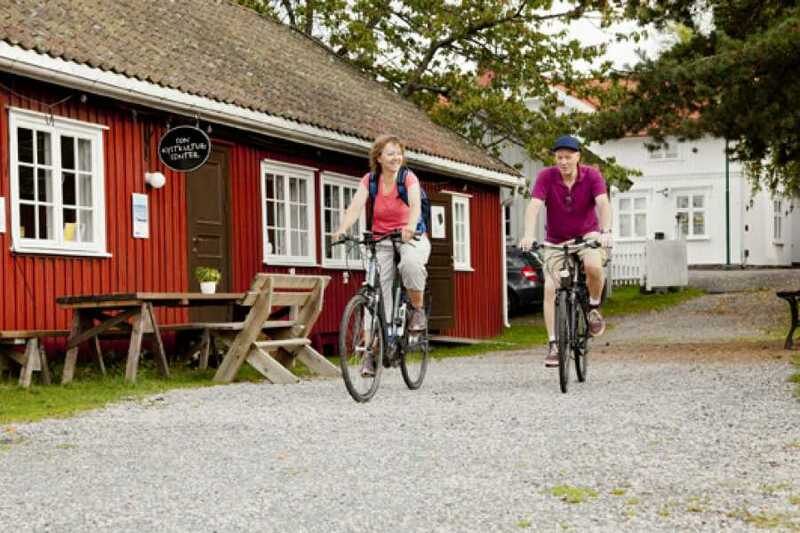 The bicycle tour ends in Drøbak (www.visitdrobak.no), a lovely coastal town where the fjord is at its most narrow. Here you can visit the local aquarium and Christmas decorations shop. 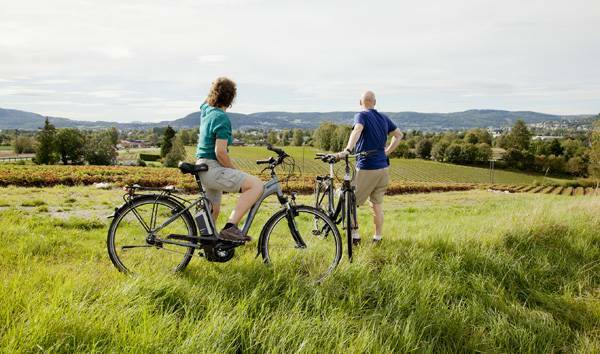 Once in Drøbak, you will park your bike and take a bus or a boat to Oslo (www.visitoslo.no). You must leave the bike and handle bar bag/rear pannier in Drøbak. Remember to bring your own small bag to store your personal belongings in. End of service after breakfast. Extra nights on request.